It is now mid December and we are in full holiday spirit! 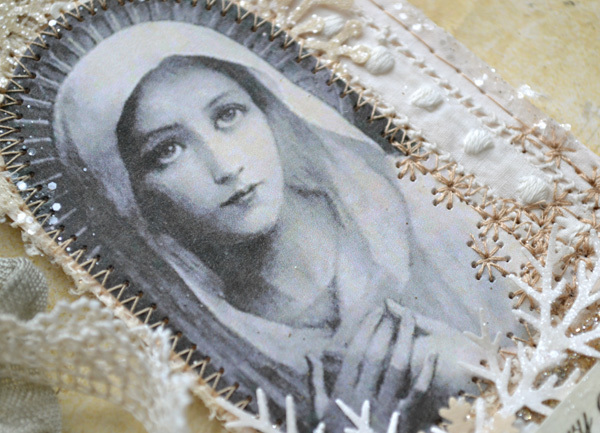 I have been stuck in bed with a flu, and I am dreaming up all kinds of things to make! Soon, I will be up again and at it. I started with jewelry and ended up with some tags. Here are three different styles for some of my family. Mary in silver and cream. I really do enjoy the stitching! I am not sure if my sewing machine agrees though! Lol! 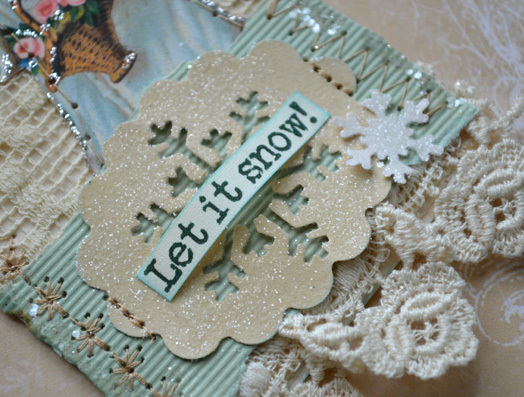 Paper and layers of all kinds of things! 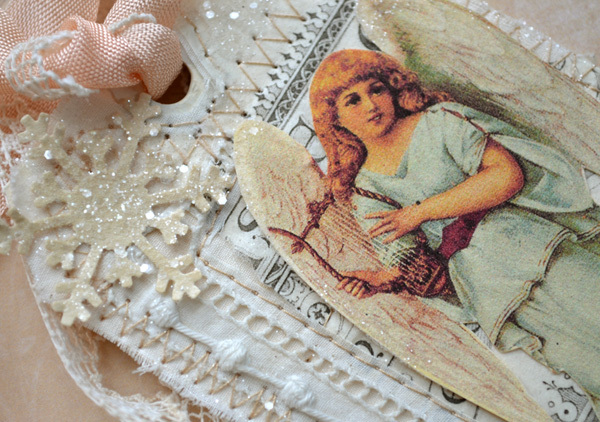 Here is a festive holiday tag, with a familiar angel image. Like the lovely blue bit of paper here is from a hundred year old paper book. And I tucked in a little piece of that old pale blue paper here too. I love the mix of fine glitter and round dots of glitter. It really does help me get into the holiday mood to work on these for loved ones. most of ours gifts are home made. Here is the new organizer I just finished last week. I really recommend it as a gift for an artsy friend. and I just couldn't let this Christmas come and go without it being created. You can see the corner of my newly covered couch, and I promise I am really going to share a full image! # 1.....a FREE online Domino Book Class! Domino book is going to travel to one of you as it is one of my giveaways! until I followed my own video tutorial and bleached it! 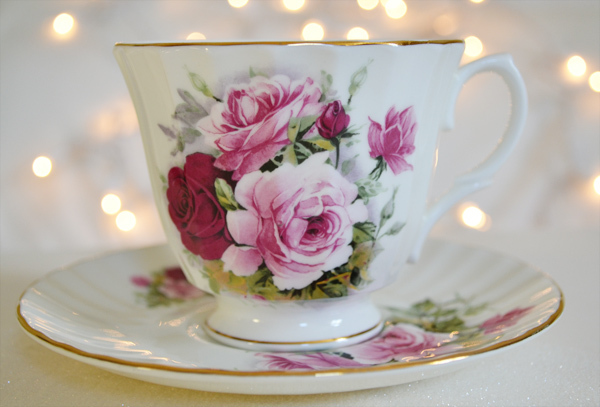 # 3...This vintage English tea cup by Mayfair! # 4...This bracelet by Sally Jean Alexander! Terri, you are so talented. I almost had tears in my eyes when I was looking at those beautiful tags you made. You do have the magic touch! Hope you get over your flu soon. I'm having trouble getting over mine. But, it's slowly going away. I guess it has to take the time that it has to take! That's what I keep telling myself. Take care! 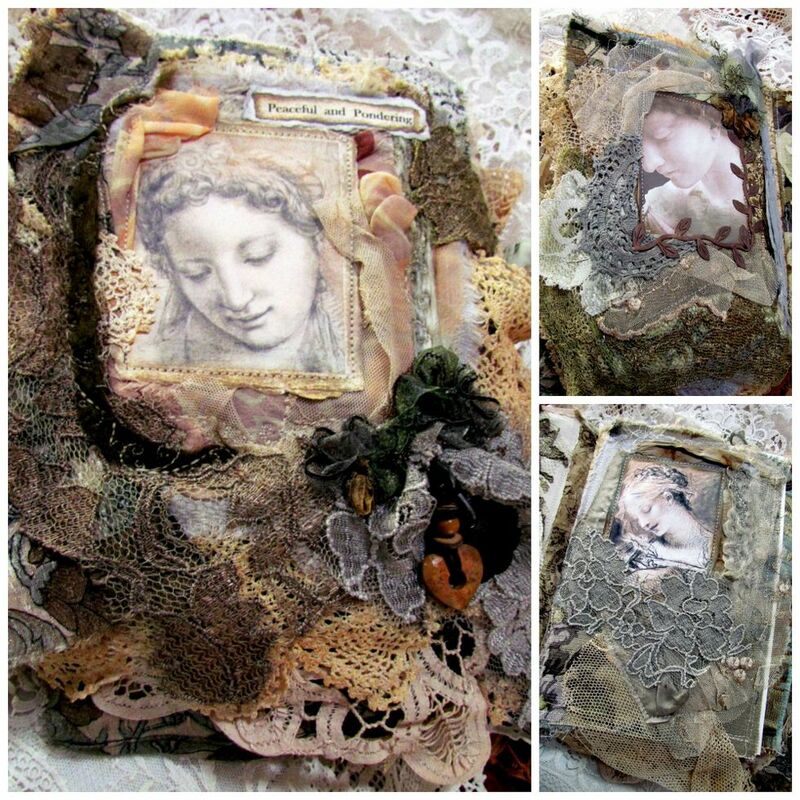 Oh Terri it´s always such a happiness to come here to your blog and watch this fabulous new pieces you create with so much love and show them in such an artsy wonderful way! but it´s a winnig for me to stop by here..
and forgot to write that I hope you are well again! Take care of you Terri! Oh dear, feel better soon! I would so love to win the sweet domino or the class!! Thanks for being so generous! Hope you're feeling better soon, Terri! Love to be included in your give away. 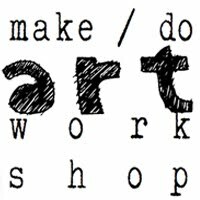 Gorgeous projects you have created. Thanks for stopping by my blog. 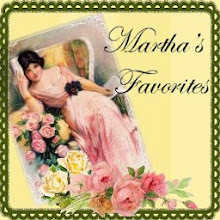 I am your newest follower; your blog is such a delight :) Please enter me in your giveaway. I would LOVE to win. So sorry to hear you have had the flu - no fun! I hope you are 100% better soon :) Your tags are stunning! I am blown away by your beautiful talent. And your giveaways are so lovely! The domino books is beautiful. The lacy tags that you made are so beautiful!!! If only I could be half as creative as you... :-) Wishing you a very Merry Christmas!! Hello dear Terri, I am so sorry to hear you have the flu! I hope you will feel better soon and be well in time for Christmas! 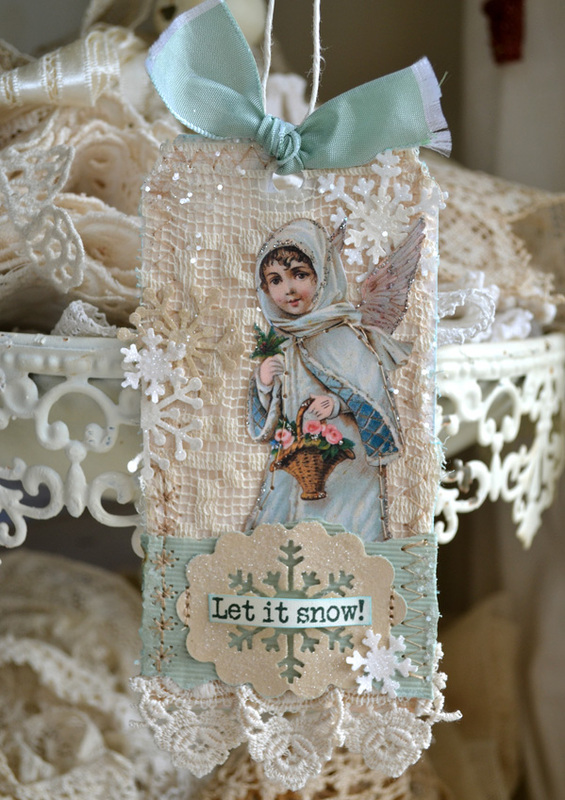 I love the gorgeous Christmas tags you made, especially the Let it Snow, little girl angel. You are very creative and talented! 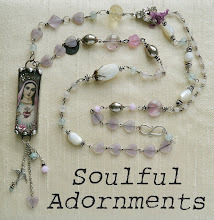 Your dear ones will love these. The organizer you altered is beautiful. I love the entire vignette as well as your white slipcover! Your giveaway is fabulous and so generous! Thank you for visiting me and for your very kind words. I was sorry to hear about your brother! That is so sad! I am 43, and did not have any cardiac care until I went to a cardiologist on my own when I was 17. I had my first open heart surgery when I was 22 and my second one, last year when I was 42. I am so blessed to be here and thank the Lord for keeping me going all of these years! I am thankful for the Mayo Clinic and the incredible team that cares for me too. Everything you do is so beautiful!! It is just amazing! 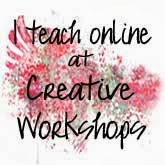 I would love to win your class so that I can watch you work and learn some of your secrets!! Hugs!! Oh Terri as always everything is stunning, I just love your style! And what a generous giveaway you have. 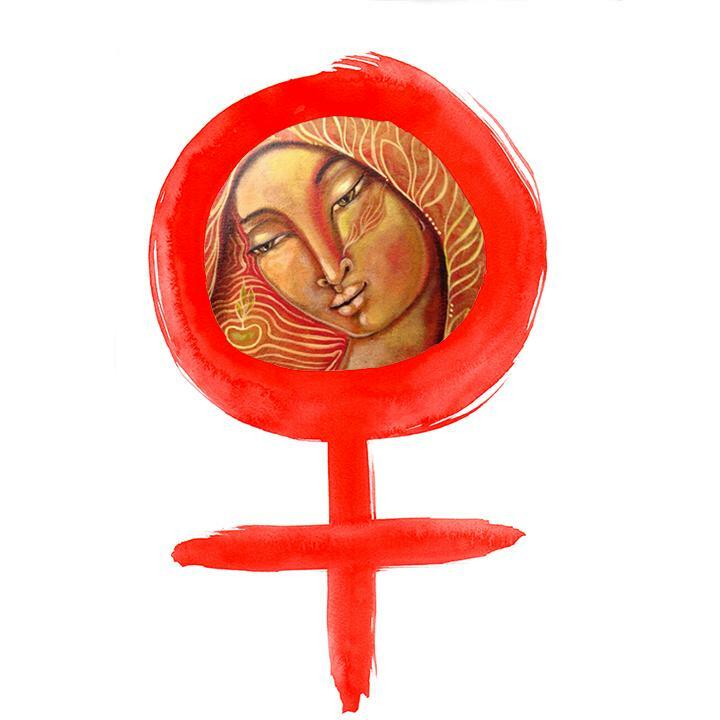 Thank you so much for sharing your tallent and generosity with the blog world. I am glad to have met you and to be able to view your tallent. Oh my goodness, Terri, your tags are gorgeous!! Firstly, dear Terri, I wish you to wellness ASAP! And now to say of course I would love to win that domino book or the bracelet, or whichever, but I am already enrolled in your class, so pass on that one for moi. I cannot tell you how inspiring you are to me. I love the angel tags. 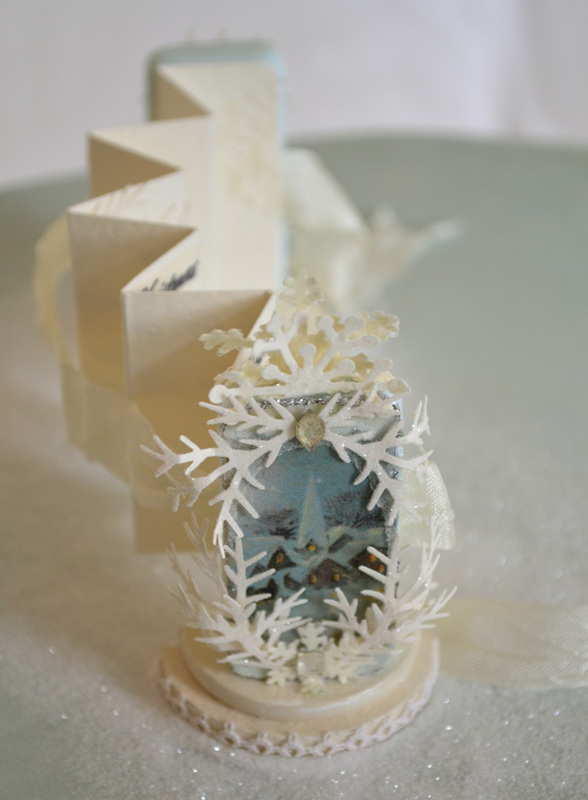 So pretty, and the one hundred year old robin's egg bleu piece of paper is exquisite! Your little organized cupboard is beautiful! Beauty is what it's all about! Hugs and more hugs, Christine. 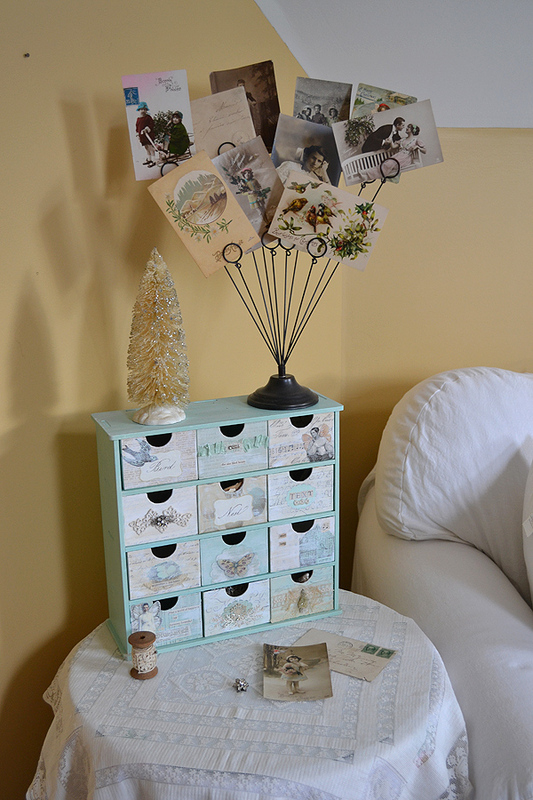 Those drawers are fabulous, I love the colour you choose and the tags are beautiful. I am blown away by your creations. One is prettier than the next. The tags are incredible. I wish I could create things that lovely. Of course,I would love to win any of the beauties. I hope you feel better soon and enjoy the holidays. 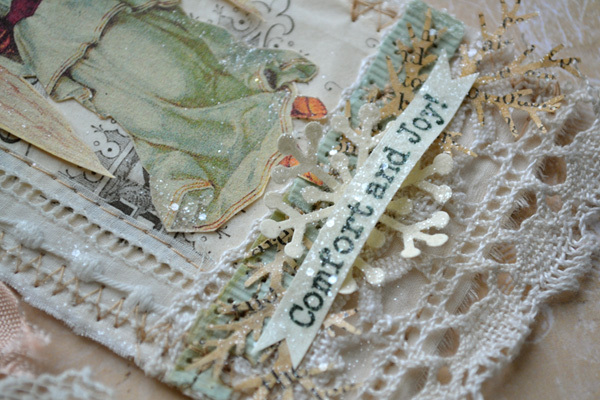 Your tags are so gorgeous Terri-such fine details! I don't know how you're able to capture the sparkle and glitter so well-I can't seem to do it. Hope you're completely well very soon. Take care. Sorry you've been sick with a bug, Terri. I haven't been feeling well either the past two days. Take care and feel better soon, my friend. Your tags are just gorgeous! I can tell you had fun working on them. Love lots of sparkle! Enjoy your weekend. So sorry you've been feeling under the weather - hopefully the bug has left the building and you're on the mend. 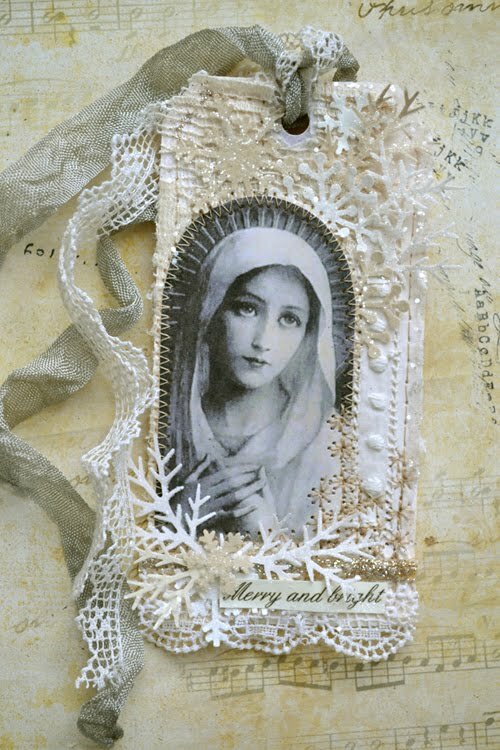 Your tags are lovely - I love the image of Mary! Oh my gosh, I love them all! Beautiful! Hope you feel better soon. What a very inconvenient time for the flu! I can just imagine you itching to get up and do your Christmas projects. The ags are gorgeous and so is that little organizer! 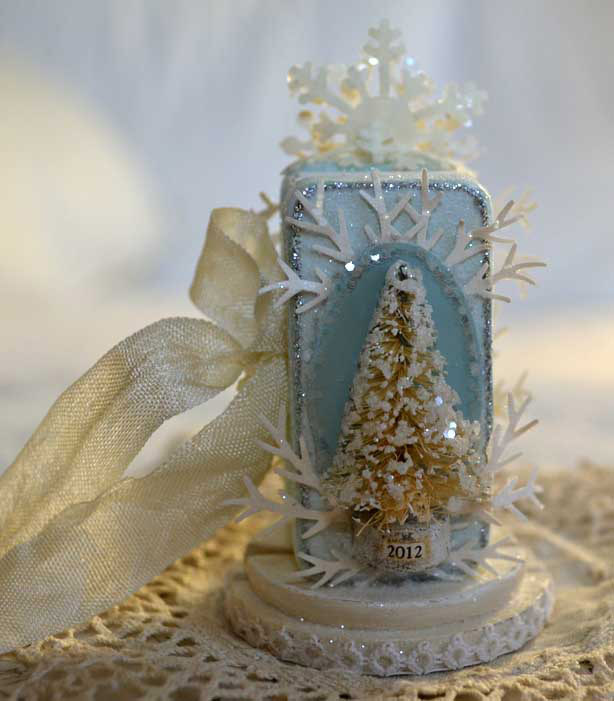 Terri, I am always amazed at your attention to detail and the lovely themes you pick for your creations. You are a calming influence in my world. Thank you, once again, for offering incredible giveaways. 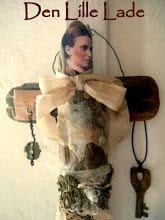 A domino book made by you would be pure heaven, or tea in a wintery rose cup....but too late for me on the domino book video as I am signed up and enjoying every minute of having you as a teacher. Great job as usual. this looks all just like magic...I love all of... If I would have to make a choic it would be the little book with the brush X mas tree, it is soo beautiful! 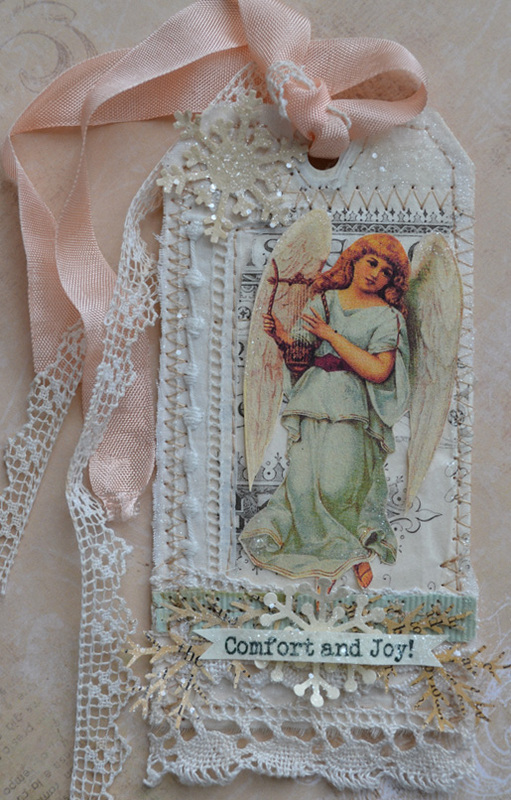 Hope you're feeling much better soon--it's no fun to be sick...love your beautiful tags! Your tags are all gorgeous!!!!!!!!!!!!!!!! So many lovelies all through your blog. Thanks for the eye candy and a chance at the giveaway. Lovely tags!!! Nail? I didn't see that nail until you mentioned it. I was too busy drooling over all the pretty things in the photo. 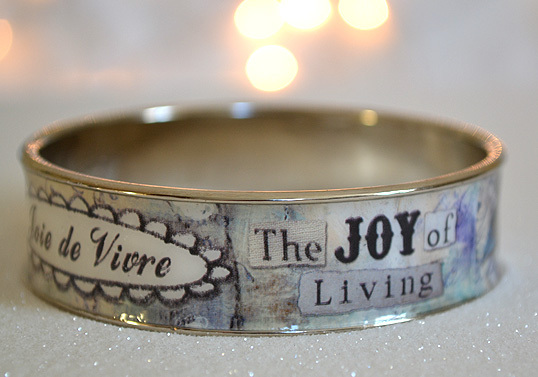 The items that you're giving away are also lovely, especially the tea cup and bracelet. I'd love to be included in your giveaway. Merry Christmas! Your tags are simply wonderful, Terri! Hope you're feeling better very soon! Thank you for the pleasure your blog has given me this year. Always inspirational. You have me hooked on tea cups too. Thanks for the chance to win something beautiful. 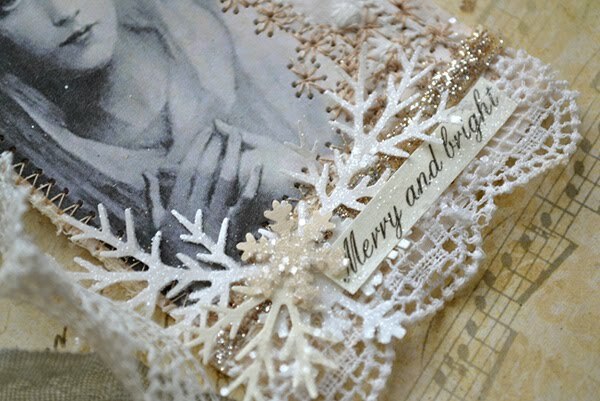 Terri you are so amazing ~ love your Holiday spirit! Thanks so much for showing your beautiful organizer, I just bought one and had no idea where to begin, but you have truly inspired me! And thank you for your lovely comments on my blog, you're great! These tags are STUNNING!!!! Pinned 'em. Just beautiful. I am enjoying everything little thing~such details and joy in everything you make. Thank you for sharing with us. I love the tea cup. It matches a little teapot I have from my Grandmother. It is so sweet. 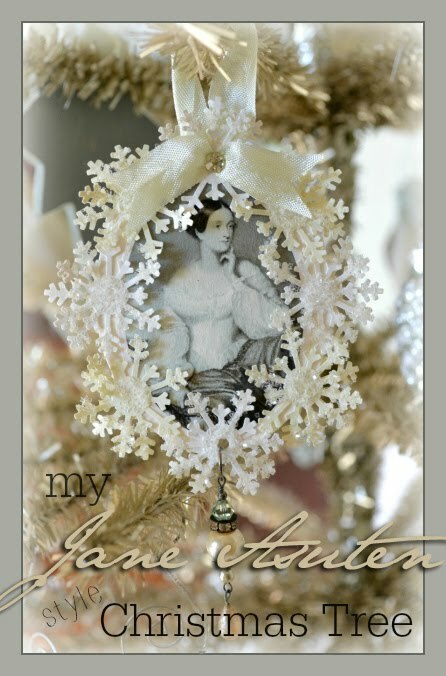 Terri - I just love these tags - everything you've done here! You always inspire me and I'm jotting down ideas to try this new year as I comment to you!! 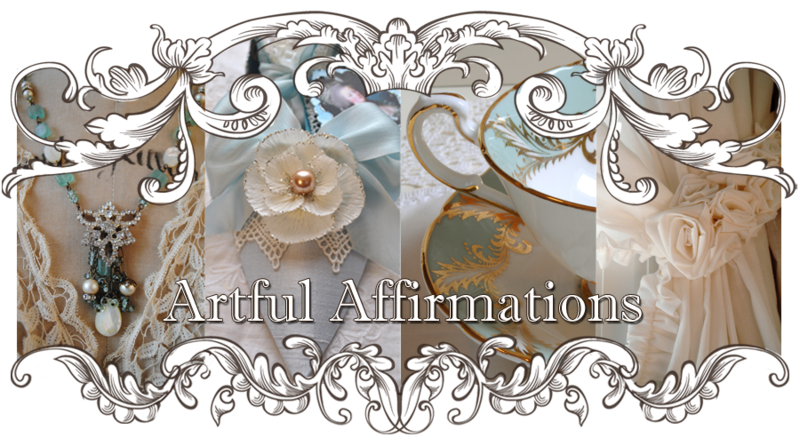 Blessings to you in all your artistic affirmations in 2013!